India has had 55 million people displaced by large dams built since Independence. 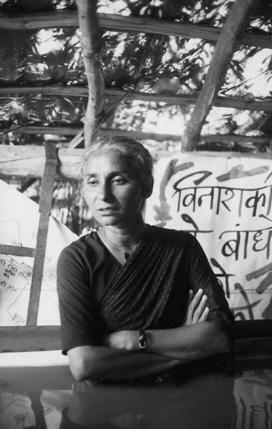 Medha Patkar is one of the founders of the Narmada Bachao Andolan, an organization that spearheads popular resistance against these displacements. 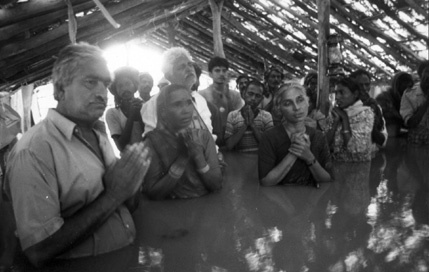 The images that accompany this live blog of the conversation between Patkar and David Harvey, Distinguished Professor of Anthropology at the CUNY Graduate Center, show satyagrahis, demonstrators who remained on their land as the dam waters slowly rose, inundating villages and threatening protests with a watery grave. This conversation between the two was moderated by Biju Mathew, Associate Professor at Rider University. Biju Mathew (BM): This is a conversation that’s been waiting to happen for many years. Both of our speakers today have played key roles in challenging neoliberalism for the last several decades. I want to open with the issue of land. Land didn’t seem to be an issue in the immediate postcolonial period, but began to be more important in the 1980s. Medha Patkar (MP): It’s a great pleasure to be part of this conversation with Professor Harvey, who has played such an important role in struggles here. Our struggles in India are no longer isolated but are part of a broader set of struggles around the globe. Land has become a key issue for both neoliberal capitalism and for people’s movements. British imperialists passed Land Acquisition Act of 1894; this same act is used to take over land of indigenous and rural peoples today in the name of the common good. What is this common good? If a piece of land is acquire by this act, then everything attached to the land – the surface water, the mountains, the fisheries, minerals, etc – are acquired along with that land. So it’s really about commodifying the property, and then legitimizing the take-over using juridical means, and then killing the people who live on the land. This take over is done in the name of progress. Multinational corporations come with one kind of capital – market capital – and say that their capital is more important than natural capital of rural peoples. Recent transformation of the Land Acquisition Act during the last three parliaments is to include defense, education, and other “infrastructural” projects. So is 70% of the land is purchased, the other 30% passes automatically into private hands. David Harvey (DH): It’s a great inspiration to be here with you. And it’s also great to be in this space, so close to Wall Street. We need more spaces like this – we need to surround Wall Street like the Maoists would advocate. But let me begin by talking about land issue. Dominant economic theory ignores land issues, focusing instead on macro-economic theory. This carries over into Marxism, which ignores land-grabs. Much of my work has been about rescuing this notion. It turns out that the bourgeoisie has made more money out of land speculation than they have out of industrial production. That’s particularly true today, when there’s a financial crisis and there’s nowhere for capital to go. So a dominant strategy to deal with this crisis is to engage in land grabs: examples include Africa and internal Chinese affairs. Another example is the proliferation of soy bean plantations in Latin America, which is part of agribusiness networks with China. Such land-grabs are about trying to find secure sources of profitability. One of theses I’m looking at right now is the idea that capital has run out of options for profitable production, and that the capitalist class is therefore trying to live the rest of its life as rentiers: land-owners, IPRs, etc. So land-grabs are not just fortuitous, but are the product of a particular phase of capitalism in which shift into land is happening. We’ve seen this before, for example when capital shifted into land and property markets after 1999 crash of dot.com bubble. One economy that’s going strong right now is China: property prices have increased by more than 800% over last five years there. Speculation in housing and land are crucial to what’s happening in China and elsewhere in capitalist system. This connects with the economy of dispossession. If land is going to become more significant, then you have to dispossess people residing on the land. This has characterized India after neoliberal turn, but similar things are happening in Africa. Indian boom is not one for the masses, but for a small elite. BM: I want to go back to the question of law that you both brought up, and I’d like David to talk a little about the history of eminent domain in accumulation by dispossession or primitive accumulation. To Medha, I’d ask you to point to both urban and rural cases, since you’ve been active with Garbacha Andolan. DH: Eminent domain is simply taking over private land in the name of the public good. But to be honest, I don’t think that this is the problem. I wouldn’t mind using eminent domain down Park Avenue. The issue is how it works. When I worked at Johns Hopkins, the university was planning to expand. Their trick was to use a subsidiary corporation to buy up properties around the university and then just board them up. They could then argue that these areas were run down, and could use eminent domain to kick the rest of the people in the neighborhood out. So eminent domain comes at the end of a broader process of destruction and displacement. MP: When the land, the life-supporting matrix, in the hands of the so-called poor, who are rich in resources, is seen in both rural and urban areas. In Mumbai, 60% of the population lives in slums, horizontal and vertical slums. Yet they live on only 6% of the land. And even that is taken over. Planners chance policies, the World Bank comes in and sets up one kind of infrastructure that fulfills the agenda of the auto industry. This displaces the people who build, clean, and run the cities. They don’t even have a place to sleep after they spend the day working to keep the city running. Slum dwellers from around the world have come together. We came together around slogan “save the houses and build the houses.” The only thing we can live on at the end of our lives is our resource base – our land and our labor. We challenged eviction of slums by rebuilding them after they were demolished. But we also challenged the builders and the construction firms, exposing the sweetheart deals they got to purchase land. We only went into the courts after long struggles in the streets. We climb up to the 4th floor of the building ministries and blockade the banks, and then the administrators have to come down. To release the land in India is just as difficult as establishing democracy in Iraq. When we can show linkage between big Western interests and land grabs (which are represented as “lawful occupations”), we get more traction. Who are the people in the so-called slums: the Dalits and others who were on the peripheries of the rural areas, and who are now on the peripheries of urban areas. They are the real builders. Human rights are about legal rights. BM: The picture you paint is of naked power of the corporate sector, so I’d argue that we’re in a situation where the politics of radical change is immediate. Capital seems to be running into limits more and more. What is your sense of these limits? In Latin America, neoliberalism takes place a decade or so earlier than in South Asia. Do you see similar social movements in opposition arising? MP: One would like to say enough is enough. But we said this in Madrid at the 50th anniversary of the Bretton Woods Declaration. 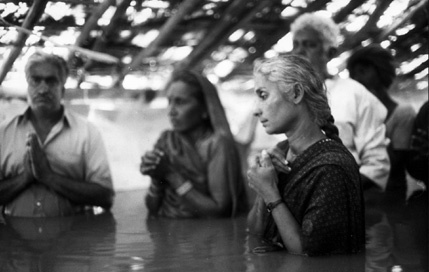 But communities in Narmada still have the sword of submersion hanging over them. The struggle continues. And not just armed struggle, which may shake the state to a certain extent. It’s really the long-term non-violent struggles, including reconstruction and bringing in theorization of living with resources, that are key. The state kills the poor – once in the name of caste, now in the name of development and progress. What is happening today in India and elsewhere is the transfer of power. Popular sovereignty over resources such as the Bolivians asserted, in order to transform lifestyles, is a key goal. We’ve stopped dam building in Narmada. But beyond issue-based movements, the bigger effort is to build alliances, which give us strength. We need to explore non-electoral popular politics. The state must not totally wither away, but it must be limited, and its occupation, dispossession, commodification, and its killing must be controlled. So we need to create new people’s politics, which is beyond electoral politics but not distinct from it. We need to know what elite’s designs are to occupy power. I distinguish between NGOs and popular power. Beyond Dalits and other marginalized peoples, the mass middle classes in India are also becoming mobilized. The Free India of Corruption campaign is an example of such civil society mobilizations: 200 people fasting were very genuine. We strive to make our movements not just national but even global – this is obviously a huge challenge just in India. We need allies in the global North who can research the connections between corruption and land-grabs in India and powerful corporations or government organizations in places like London and New York. We look at the People’s Parliament as one such struggles. DH: One of my favorite quotes from Marx is that the state is the executive committee of the bourgeoisie. This is not true everywhere, as in Bolivia. But it’s more and more true around the world over the last 30 years. So you not only have to do battle with capital, but also with the state. We see in the US how the Supreme Court belongs to the bourgeoisie. All these institutions have been taken away from real democracy and the people, and isolated so that we don’t see how budgets are made. How did this come about? It all goes back to neoliberalism and the crisis of the 1970s. out of this crisis a solution emerged. There are two kinds of costs that capital doesn’t want to bear: environmental degradation & social reproduction (who raises children, cares for the sick, etc). Capital tries to turn these into externalities, so they don’t have to pay for them. Historically, social movements pushed the state to pay for some of these costs. By the 1970s, you have the establishment of the EPA, welfare, affordable housing, etc. What neoliberalism was about was forcing externalization of these costs by dismantling the welfare state. the strategy behind this was interesting. When Reagan came to power, he cut taxes for the rich and launched a debt-financed arms race with the Soviet Union. Towards the end of his administarrtion, his budget advisor David Stockton admitted that his strategy was to creat a huge debt so that they could then go after social programs. Bush Sr. and Jr. did the same thing, and now Republicans in Congress and in state governments are doing the same thing: arguing that social programs need to be cut to deal with debt. David Cameron in the UK is doing the same thing: you never let a good crisis go to waste. Same thing happening in Ireland, Portugal, and other places, and their standard of living is crashing. This strategy was exported in the 1980s using IMF structural adjustment. The upshot is to create a global plutocracy, with about 400 families controlling a huge amount of the wealth around the world. There’s something else crucial to put into the picture. Capital is a growth machine; it’s committed to 3% compound growth annually. This was one thing in Manchester in 1800. Today it’s another. Capitalists have been running into difficulties finding profitable outlets. So instead of investing in making things, you invest in owning them. Which is why under neoliberalism you have an acceleration of accumulation by dispossession. And it’s also a dispossession of rights: pension rights, health care rights, housing rights (which have been almost totally dismantled). My argument would be that we need to think about a zero growth economy. This is not a zero development economy. But it is a state in which we no longer need 3% compound growth. If we want to reject this 3% compound growth rate, we need to reject capitalism. We need a global anti-capitalist politics. But this is hard to achieve, because we constantly hear the argument that we need more capitalism. I say that people in anti-poverty organizations that they’re in the wrong organization: you should be in an anti-wealth organization. You can’t solve the problem of poverty without destroying global plutocracy. People are realizing that we need a global anti-capitalist organization. MP: Communal commons are being taken over, and so we question the present form of the polity. Just like we question the present form of the economy, which is rule based on inequity. We cannot look at the state as our ideal. Hence we are neither statist nor marketist. We want popular movements to be part of decision making. Here principles of self-reliance would be central: rights to resources and also human rights to life, biodiversity, etc. We have to think about new forms of institutions, which are forms of new consciousness. We’re also not in favor of notions of conservation that say that we can’t touch the forests etc., but we are in favor of collective responsible use of the commons. Our vision may sound utopian, but we have to be utopian today or we’re doomed. BM: What we’re talking about is not just material change but also a change of consciousness in people. In the US, people think in terms of hyper-individualism. Such consciousness is being exported to India. How do we transform this attitude into a different sense? Where would we look for answers? MP: Our social identities being fragmented and atomized is worse than corporatization. In fact, what the trend towards marketization is doing is exactly this. Hence the revivalism that also sometimes takes a dangerous turn, towards fundamentalist assertion of identity at the cost of others, regionalism that excludes those who are from other areas. We need to question divisiveness. We have to be in struggles, but we also have to be in reconstruction. Creating schools so that children in Adivasi communities have a sense of identity. And even strategies like the alternative media are important. And time is short. DH: What I try to do in my work in works like The Enigma of Capital is to give an outline of how social change takes place. There are 7 spheres in which change has to take place: 1) transformation in our relation to nature; 2) technology; 3) social relations; 4) production; 5) daily life and reproduction processes; 6) institutional arrangements (law, etc); 7) mental conceptions of the world. Social theory tends to focus on only one of these spheres. Paul Hawken for example stresses consciousness alone. Orthodox Marxism focused on economics alone. But Marx himself showed that end of feudalism involved all these spheres. And this is what neoliberalism did as well. Neoliberalism changed not just economics but also social relations: there were many more collective solidarities around in 1970 than there are today. Social change happens by all of us collectively working on elements of this ensemble that we’re good at. All these changes take place slowly. The issue today is that there’s no radical new strategy emerging from the bourgeoisie. The 1930s gave us Keynesianism etc. The 1970s did the same, even if it was horrendous. There’s no equivalent today. Only strategy is to try to find an arc and ride out the storm. So this is a moment when there’s a possibility of change. One of the big difficulties today is that we have this huge infrastructure of universities that is almost entirely devoted to maintaining the status quo. In US, it’s totally impossible to get through to mainstream journals. And we can’t of course get through to mass media. The Left also hasn’t done a good job since a lot of what we produce is incomprehensible. But I recognize that no matter how much mind-changing we do, we also need institutional changes etc. BM: Let me turn our discussion to ecology and the question of resources. In India, what we’re seeing right now is the imperative to just dig resources up and sell them to the world market. The state and the bourgeoisie is in such collusion in this regard. How do we deal with the ecological limits we’re up against? MP: Our movements build not just on Marxism but also Gandhian and Ambedkarian thought. But all these ideological trends have to come together. All these ideas are leading communities towards self-reliance. We oppose eminent domain of the state to eminent domain of the people; they would have right to use and conserve the natural world. They would know the stakes inherent in the resources at hand; these stakes are nothing short of survival. There’s a danger in addition that so-called renewable energies will continue to perpetuate dispossession. Solar energy in India, for example, was to be a project of Enron’s. DH: My approach to the environmental issue is based on idea not of technologies but on how social life and institutions would have to be arranged. In the US, the attitude is that there will be a technological fix. This is totally false. What we really need to do is to change social relations. If we wanted to do something serious here, for example, we could just demolish the suburbs. This would also be a big employment generator. We need to think about a real transformation in our relation to nature. The Cochabamba Declaration is an example of this. Also, work is being done on challenging agribusiness and showing that more labor-intensive forms of agriculture are more productive. This would again solve the employment problem. There are ways we could start to reconstruct the agrarian base. There’s also a big paradox: wind power, for example, requires rare earth metals. Mining this is an environmental disaster, but it is also 90% controlled by China because they don’t care about environmental damage. So we’re faced with a situation in which a solution in one area creates problems in another. 1) The rural-urban divide and the north-south divide: how do we theorize these? 2) What struggles do you see that effectively challenge finance capital? 3) What kinds of organizational innovations can we see that can bind together different struggles since we see a lot of local, molecular organizing but little more broad-based molar work? 4) What other utopian solutions can you tell us about? 5) What do you mean by zero growth and how is it different from development? MP: cities are growing like mad at cost of communities that once occupied the land. The entire infrastructure is import-export based, taking a toll on both the rural and urban areas. We see no attempt to keep people on the land in India, and as a result the urban poor population is booming. There’s a huge shift of land from agriculture to non-agriculture going on in India. DH: The tendency under capitalism is to industrialize the countryside, erasing the difference between rural and urban areas. Theoretically I prefer to use the concept of uneven geographical development, which is going on inside cities as well as between the city and the rural. In US, countryside is being taken over by the rich, who go to mansions in places like Long Island. But there’s a distinction between what’s happening in so-called emerging markets, where all the growth is taking place. As a result, there’s some geopolitical tension between the so-called BRICs, and older centers of finance capital. The question of how to organize is a complicated one. There’s a lot of movement going on around the world: factory occupations in Argentina, solidarity economies around the world, etc. in part, this arises from the fact that capital doesn’t need most people any more. Some of these have been economically quite successful: eg. Mondragon in Spain. Biggest economic disparity in Mondragon is 1-3, whereas in typical US corporation disparities are 1-600. Mondragon’s genius was to not just produce, but to organize credit and retail. Having said this, I find that many radical organizations are plagued by the fetishism of organizational form: many insist on remaining totally local, are totally anti-hierarchical, and are completely opposed to any kind of negotiation with the state. The result is that you’re not in a position to scale up what you’re doing into anything that can go beyond the local. If you say you should, you’re labeled a Leninist. There’s a strong appeal of anarchism, localism, etc. today. But this is not to say that there aren’t organizations that put things together: Via Campesina is an example. It has great ideas at the local level, but is also making a global movement that can deal with global environmental issues. This seems like one of the big challenges the Left faces today. MP: Our struggles may seem utopian today, but you never know when things may change. When we battled Enron, we never expected to see their CEO tearing his clothes in the streets here in NYC. DH: One of the troubles with utopian plans is that they evoke a model of harmony that is static. That’s why no Christians want to go to paradise, because it’s boring. Alfred North Whitehead talked about the perpetual pursuit of novelty as being a characteristic of humans. It seems to me that many human capacities and powers are denied by market culture. Not that there needn’t be a material base. But we could, in many part of the world, just freeze the economy and begin exploring human creativity, and not allow it to be channeled by corporate growth. MP: We need to check the growth of capital, which brings in parasitic exploitation of the majority who are productive. Not that there should be no change, but change in the value framework of society. Who would define and decide what the change should be is the critical question. Zero growth and zero aid: we need self-reliance. We are struggling to set up popular tribunals, popular education, etc. to further this ideal of self-reliance. We cannot wait for this change, we have to make it now.